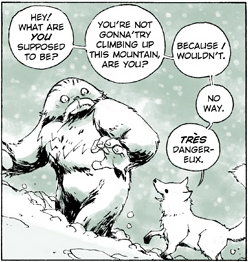 There are so many webcomics out there to read, I'd like to direct your attention to one of my favorites: The Abominable Charles Christopher, done in an ink-wash style by Montreal artist Karl Kerschl. Charles is a silent protagonist, a kind of skew-eyed sasquatch... yeti... thing, neither quite man nor beast. At the start of the comic he stumbles his way through the woods, until the guardian of the forest gives him a quest to mystically weaken the encroaching human city and its hunters who threaten the local balance of nature. Although this comic only comes out once a week (on Wednesdays), it's worth the wait. Some strips are throw-away gags, but if you keep up with it, you'll start to see recurring characters and themes emerge. Charles' quest sometimes goes places that are eerie, dark, tragic or sinister. Yet at the same time it's cheerfully interspersed with the quirky lives and personalities of the many forest animals. Alternating between serious segments and comedic ones makes for quite the contrast in moods; still, it works. In 2011 it won the Eisner Award for Best Digital Comic. One theme that recurs is a stance against hunting and/or cruelty to animals, but it's not being preachy or obnoxious about it, and it's very infrequent. More interestingly (to me, anyway), there's been a gradual shift towards incorporating elements from Mesopotamian mythology. I think what works best about the comic is that Kerchl isn't hurrying the story, using a pace that keeps it compellingly enigmatic. It's now into its fifth year, having started in June 2007. (I don't know if Kerschl intends it to continue indefinitely or if there's a specific ending in mind; if the latter, I'm guessing it'll be within the next year and a half.) Occasionally he takes breaks from the strip, either by showcasing a particular animal character, or having guest strips drawn by other artists. If you follow this comic for long enough, you'll definitely develop a soft spot for certain animals and their ongoing side-stories. Who will it be? The raccoons? The rabbit in love? The heavy-hearted ex-circus bear? The cockroach psychoanalyst? The bird with marital problems? The viral-marketing skunks? This comic is just brimming with character. I would really like to see this artist invited as a con Guest of Honor. 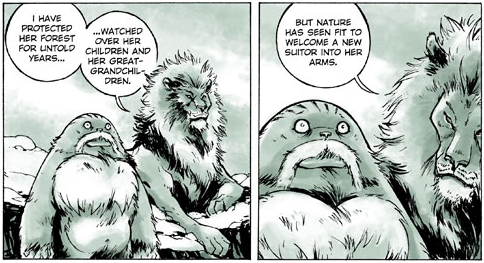 In my opinion, this is one of the best anthropomorphic comics out there right now. Give it a try! It's worth mentioning how there's a huge chunk of the comics missing from the online archives between April 2011 and November 2012. They are working on restoring them, but if you're planning on reading it, you will be missing part of the story. And yes, the anti-hunting stuff does get pretty damn preachy about it. It doesn't necessarily detract from the story, but it is obvious enough to stand out. This is awesome artwork. I knew the comic but wasn't aware it was in print. So, I'm happy to be the first place I know of offering it in the US through my dealer business. Or check here for my most updated furry book listings. Nice job. Good things deserve attention.